Back in March this year we saw some prototypes of the new GlobalSat GPS PDA mount. Just recently GlobalSat productised this and released it for sale. Well for the last few weeks I have been testing it out in the PocketGPSWorld.com car. Thanks to EasyDevices.co.uk for providing us with a Globalsat GH-101 to review. 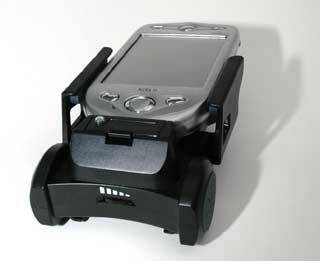 The GlobalSat GH-101 is a powered PDA Mount with a built in amplifier and a GPS receiver. In fact all you need to do is plug your PDA into the holder, connect the audio cable and navigate to your destination. 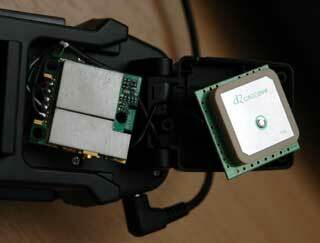 The GPS is activated as soon as the unit is powered and starts looking for satellites to confirm your location. The amplifier though not powerful makes the use of a PDA such as 2210 which has a very low output feasible. 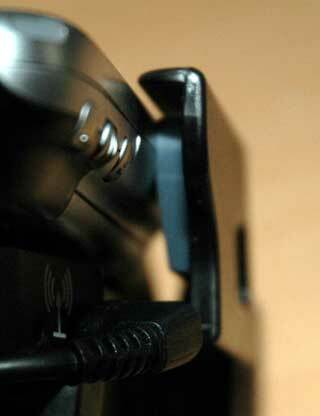 At the same time the PDA is held firmly in place and powered through the connector at the bottom of the device. 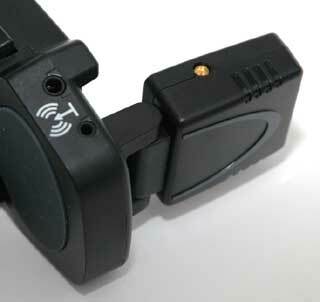 The GlobalSat GH-101 supplied to me for review came with the main holder, a cigarette power adapter, a windscreen suction mount, a PDA specific connector, and an audio hook up cable. ˙Altitude Limit: 18,000 meters (60,000 feet) max. ˙Velocity Limit: 515 meters/sec. (1,000 knots) max. As mentioned above the GlobalSat GH-101 is billed as the all singing all dancing PDA holder amplifier and GPS. 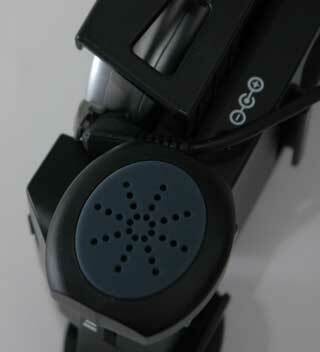 The picture to the right shows the main holder with the interface modules underneath. The little "legs" at the bottom of the holder house the speakers from the amplifier. At the base of the holder you can just about see the volume control. To the top left is the connection sockets for the audio lead, and the GPS antenna is on the back of the holder. 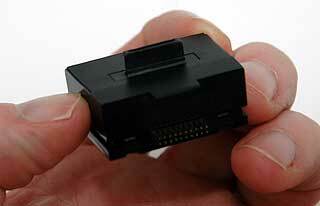 The GlobalSat GH-101 GPS PDA holder is very flexible in that it comes with interchangeable PDA interface modules. This neat little feature means that you can change your PDA, or as in my case use different PDAs without having to change the mount. All you need to do is change the little interface connector. These PDA interface modules simply slot into the guides and when the pins on the connector are seated properly the whole module clips together. The connector interface module was covered above. The picture to the right shows (apart for some nicely manicured finger nails) the interface connector module. The design of the holder means that simply changing the module provides the means to provide compatibility for a large number of PDAs without having to create (and retailers having to stock) large numbers of different holders. If you look closely at the bottom you can just make out the pins that connect into the holder. One of the primary functions of the system is to securely hold your PDA. This is achieved by two sprung arms. These are L shaped and have non-slip high density material inside the L.
The picture to the right shows one of the arms. The non-slip material is slightly recessed in the arm so that the L forms a slight lip. Having said that the lip does not come into play when holding the PDA as the arms angle out slightly when the PDA is inserted, and the PDA also has a rounded body preventing direct contact. The image to the right shows a close-up of an XDA2 fitted in the holder. From this angle you cannot quite see the non-slip inserts, but you can see the lip. Now the most important thing with any holder is the way it grips and supports what it is holding. There is always a lot of concern regarding the suitability of these type of sprung holder, particularly when you have rough road surfaces to negotiate. This does not seem to be a problem with the GH-101. Apart from the the non-slip surfaces being very sticky, the PDA is actually at the base of the holder by the connector. I tried numerous ways to try and assist my 2210 iPAQ and XDA2 to "fall out" of the holder (under lab conditions) and failed abysmally. The design of this holder really does work. In fact it was more of a problem for me as I found it a bit tricky sometimes inserting and removing the PDA. Eventually I discovered a way that works well for me. 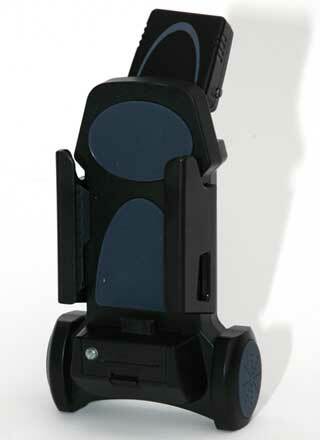 I open the arms of the holder with my thumbs whilst inserting or removing the PDA. GlobalSat claim that the GPS antenna has 2 positions. This is not strictly correct as there are a large number of positions that cane be used. Some more effective than others. 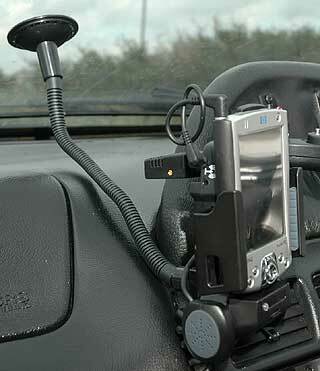 The GPS Antenna folds flat against the back of the holder, and can also be extended to 90 degrees or 135 degrees. Depending on the strength of the signal the antenna can be in any of these positions. Not only can the antenna be tilted, it can also be swiveled in 3 positions. This makes it quite flexible. There are of course some cars with heated or coated front windscreens with these cars it is often difficult, or impossible, to get a strong signal. If this is the case don't worry there is a small socket for an (optional) external antenna. 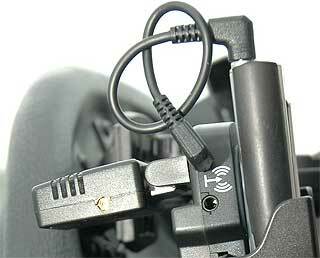 The GH-101 holder has a built in amplifier, and is supplied with a short fly lead to connect the PDA to the holder. If you look a the picture to the right and the one above it you will see 2 sockets. A 2.5mm and a 1.5mm one. These seem to be wired together inside the holder and were a bit of a mystery to me until I switched from the iPAQ 2210 to the XDA2 than all became clear. 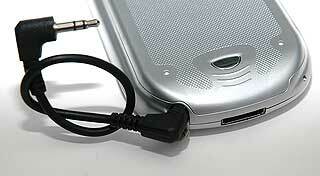 The audio fly lead has a 2.5mm plug and a 1.5mm plug. The 2210 has a 2.5mm output socket, but the XDA2 has a 1.5mm socket. All you need to do is connect to the PDA and then that will determine which socket to use on the holder. Clever bit of design there. The picture to the right shows the location of the speaker. There is one on each side at the bottom. From this picture you can also see how tight the XDA2 audio fly lead is in the holder. It does fit, but only just. In fact the XDA2 flu lead suffers from a slight design problem. The plastic around the plug is too wide for the recessed XDA socket. It took me a while to realise that it wasn't the holder that was a problem with the audio, but the design of the cable. The actual issue is that the plug molding is oval, and when inserted into the XDA and twisted to a position to run the fly lead to the other connector it was turning, and the oval shape was forcing it to twist out of the socket. A simple "Blue Peter" style solution was found. Using a sharp Stanley knife I "re-modeled" the 1.5mm end and now it all fits perfectly. The fly lead is very tight and could do with being an inch longer. It does all fit though. The picture to the right shows the modified cable for the XDA2. I am not sure why this system was designed in this way as the headphone socket does not seem to be in the right place at all. I assume this is a hardware requirement. It is not positioned in the most logical of places. 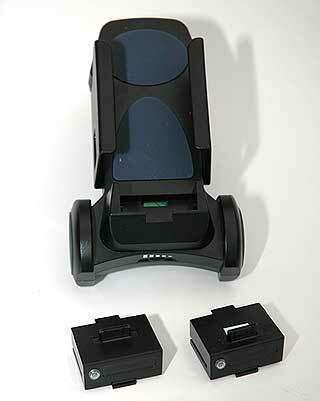 Finally the shot to the right shows the underside of the mount where the volume control is located. The amplified sound from the holder is not the loudest, nor the best quality from the speakers. That said it is sufficient at motorway speeds, but would not be my first choice for playing music. Oops I am so clumsy! It always seems that when I drop something it falls to pieces and at the same time my camera takes a photo... Honest officer! Inside the antenna housing is a patch antenna and the GPS chipset. As you can see from this image the GPS chipset is very well shielded and due to the position of the antenna is well removed from sources of electronic noise such as the PDA and the mount's amplifier. To the bottom of the GPS chipset board you can just about make out the connector for an external antenna. Although the chipset is not specified on the website it is in fact based on a SiRFstarII chipset. 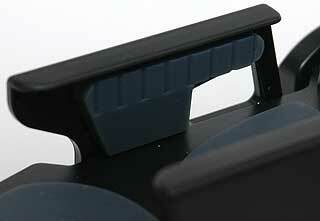 So far we have been detailing the the functions of the GH-101 holder. The other important aspect of the system is how it connects to the car. This is via a 18" (yes 18 inch) gooseneck with a suction pad at one end and a bespoke mounting plate at the other. Now when I first received the holder I took one look at the length of the gooseneck and thought "that isn't going to work". Well at first it didn't, but when I got the knack of fitting it it was fine. With a mount of that length I was expecting a lot of vibration, but the trick is to bend the mount to shape and then ensure there is a slight amount of tension pressing it into the dashboard as you vacuum the sucker. That way the mount has a foundation on the dash rather than vibrating from the windscreen down. I am a fan of different mounting systems, and prefer to use alternates to windscreen mounts. Unfortunately due to the bespoke nature you can only use the GH-101 with the windscreen mount. I used the GlobalSat GH-101 in a variety of different environments. From motorway driving to driving down unmade tracks. Initially I had a lot of trouble with the holder and PDA vibrating, but once I had worked out the correct set-up the movement was comparable with my other mounting solutions, and in some cases better. The GH-101 was given one of the most severe tests possible as one of my wheels is out of balance and has serious vibration between 65 and 70. For a lot of applications the 18" mount may be far too long, but it was Ideal for where I needed to position it in my car. I would have preferred to see a HR style connector or adapter plate to allow for a variety of mounting options. For spring loaded clamp systems this is the best one I have reviewed so far. The audio output is neither the loudest, or the best quality. A lot of my music files experienced a lot of distortion at louder volumes. But you have to bear in mind it's purpose. It is for amplifying the pitiful volume of the iPAQ 2210 and similar PDAs for voice guided navigation, for this it worked fine. Although the GPS chipset is the older SiRFStarII the satellite fixes and navigation were good. I only experienced one extended fix time and that was when I started the car in an underground car park and was stuck trying to get out for about 15 minutes before the GPS was able to see any satellites. After this it took a few minutes to fix, but did so on the move. 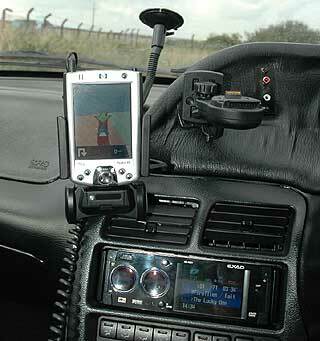 If you are looking for a fully integrated amplified, GPS, PDA Holder then this should certainly be on your shortlist.